Ah, yes, the waves, the wind, the sun, the Abacos. Yeah, another. I stick "em" in between, thought you wouldn't notice. Another Abaco sunset. Yep, another one. No worries, I'm seeking therapy. K.
Alan's-Pensacola, we have stopped off here a few times, one of our favorites, great mangrove flat with big spooky bones and plenty of 3-5 lb 'cudas. Just ask Bill & Dave! Now ain't that a boat! She just loves a good blow, here we are sheltered, 15-20kts, normal in the Bahamas. We drop an 88lb Delta on all chain, put out a 7:1 scope, put out the bridle, back down gently until we get a "set" then increase to 1,000 RPM, then 1,200. She usually grabs big time right away. If the anchorage is tight we shorten up the scope after we are well set, usually never less than 5:1 including the bow pulpit to water. We have been in 30-40kt squalls, and one that a neighbour boat with a wind thingamajig says was 55kts during a squall. We held fast. Easy here compared to Georgian Bay. Pat & Ted on Seaclusion join us at Alan's-Pensacola. Yes there really is a Kadey-Krogen Family. Wherever we go we meet up with "Krogenites" and they are all so welcoming, as well as interesting , living life, fun! Another Abaco Sunset, yes I'm obsessed, wait until I get into Sunrises! K.
Sam hates this boating life! At anchor, somewhere in the Abacos. 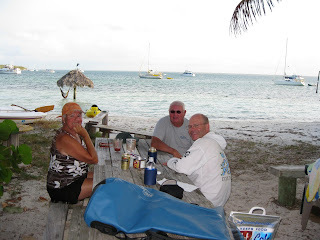 Ted & Tim, local fishermen we met at Alan's-Pensacola Cay. They were running low on supplies, we traded gas and groceries for fresh conch, grouper and stone crab!